Getting the MOBLE NETWORK NOT AVAILABLE error on your Android device is one of the worst things that can happen to you. You could be expecting an urgent phone call or need to make one but you can’t. The causes for the mobile network not available can vary, but, don’t worry, it is fixable. 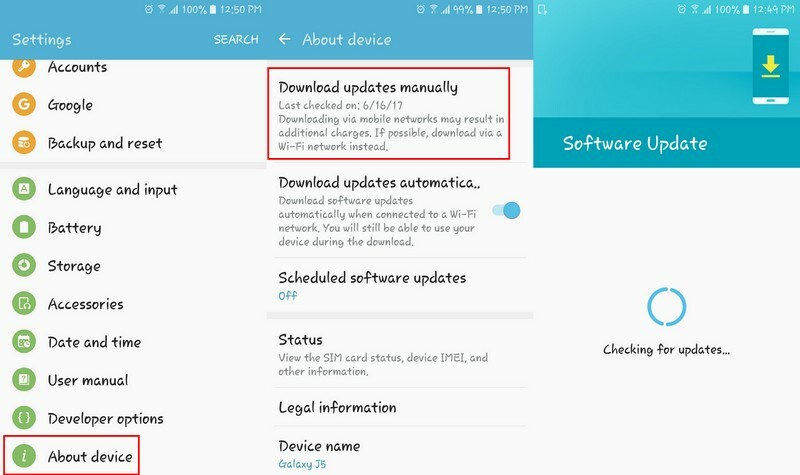 Even though this is an error that mostly appears on Samsung Galaxy devices, it has been known to appear on other models as well. The following methods will help you get rid of the mobile network not available error, and you can finally use your phone again to make calls. What Causes MOBLE NETWORK NOT AVAILABLE Error? There are various reasons as to why you’re getting the mobile network not available error on your Android phone. You could have removed the SIM card from your phone and then didn’t properly reinsert it. You may have been in a hurry and didn’t realize that. No tech giant is perfect and will experience problems. Maybe your mobile carrier is having problems, and in that case, you can either call or wait it out. You could also have a faulty SIM card, and the only fix for that is to get a new one. Other possible reasons for mobile network not available error could be that you have Airplane Mode on or that your phone is roaming. 1 What Causes MOBLE NETWORK NOT AVAILABLE Error? Like I mentioned earlier, your mobile carrier could be experiencing problems with their coverage. If you don’t want to wait it out, you can try restarting your phone to see if that fixes the problem. Don’t forget that you can also call your Internet service provider to see if the problem is on their end or not. Turn off your phone and remove the battery followed by the SIM card. Wait a few minutes and then put everything back in its place and reboot your phone. Hopefully, this will do the trick, if not, try the methods below. That was the simple method that involved removing the SIM card. If that didn’t work, then you’ll need to try the solution that requires you to do a little more. Open your phone’s Settings and choose Mobile Network Settings. Press the home and power button together until your device shuts off. Now, remove the battery and press the home+power button together ten times. Press the home and power button for one or two minutes to completely drain your phone of power. Put the battery back into your phone and turn it back on. After this, the mobile coverage error should be gone. I know that these seem like a lot, but it’s worth it since it could mean you are recovering your phone. 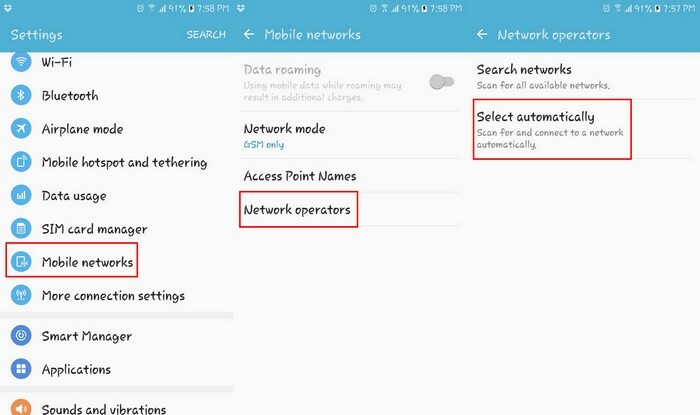 Setting the mobile network automatically is another method that has worked for many users to fix the mobile network not available error. You can easily set this up on your Android device by going to Settings > Mobile Networks > Network Operators > Select Automatically. If you notice that your phone just keeps searching without finding anything you could just be out of your coverage area. Try going back to an area that you know your mobile carrier does cover and see if the mobile network not available error message goes away. Updates are great since they are made to fix any bugs that your Android device can have. Even if it’s one that is causing the mobile network not available error. The updates usually appear on their own on your phone but if you want to make sure that your software is up to date you can check yourself. Go to Settings > About Device > Download Updates manually. Your Android device will start checking to see if any updates are available. If one is available, here is where you’ll be able to download it. This might seem like a drastic solution to some but starting from zero does have other benefits besides getting rid of the mobile network not available error. A reset will wipe your phone clean, and it could get rid of the network coverage error that is causing the coverage error on your Android phone. Besides, that it can also be a huge help if you’re having storage problems like I was and it was a huge push in the right direction. This is an error that is more common in Samsung Galaxy devices. There are certain codes you can enter on your phone’s dialer, but you have to make sure that the code is made especially for that model you are using. If you use a code that is meant for another device, you could cause some damage to your phone. Open the dialer app and dial *#*#4636#*#* and you’ll see a testing menu. Tap on where it says click phone/device information > select Run Ping Test > Select GSM Auto (PRL) > Choose Click Turn off radio. Now, reboot your phone, and your phone should be working correctly now. The majority of the time you will probably hold your phone in portrait mode. The only reason you might hold your phone in landscape is to take a picture or use an app that can only be used in that position. The problem with holding your phone in landscape mode is that you may be covering your phone’s antenna. Besides holding your phone in landscape mode, the case you have on our phone could also prevent your phone’s antenna from getting a good signal. A case that has been known to cause this problem is the rugged phone cases. They are made to help protect your phone if you should ever drop them but could be preventing you from getting a good signal. Take your phone out of the case and avoid landscape mode. Hopefully, by doing this, you won’t have to deal with that error message anymore. So, you’ve tried everything, and nothing seems to work. The solution to your problem could be as simple as moving to another network carrier. Not all of them offer the best service out there, and that could explain their low prices. Ask around and do some research. Try to figure out the top service providers in your area and go with the one that offers plans that are within your financial reach. If moving to another network carrier is out of the question for you, an app just might do the trick. One of the best signal boosting app you can try is called Network Signal Speed Booster. It’s free to install on Google Play, and it has a very good rating from its users. If it doesn’t improve the signal enough to make the mobile network not available error go away, you won’t have to deal with the refund process since it’s free. If that one doesn’t do the trick, you can try another signal boosting app called Network Signal Booster. It also has a good rating, and it’s free to install. It has a better rating than the first app. The Mobile Network Not Available Error is something that every Android user is going to face sooner or later. You may try to do everything humanly to try and avoid it, but you still have to deal with it. The above methods will help you to finally get rid of the mobile network not available error and use your phone like before. There’s no way of knowing which method is going to be the right one for your device. All you can do is try them one by one until you come across the one that does the trick. Have you encountered the mobile network not available error on your Android phone? If so, what methods have worked for you to fix mobile network coverage? Leave a comment and let us know what you think of this error.